In a large bowl or in a bread mixer, combine the bread flour, yeast, sugar, salt, warm water, yoghurt and oil. Knead for 10 to 15 minutes and let rise for 40 minutes or until doubled in size. Divide the dough into 6 portions and roll into 20 cm by 10 cm oval shapes. Place on individual squares of baking paper. While the barbecue is preheating, make the herbed butter. In a saucepan, over a side burner or stovetop, melt together the butter and the garlic cloves. Cook for 3 minutes on a medium heat or until the garlic is golden. Add the herbs and cook for a further 2 minutes. Remove from the heat and season with salt and pepper. Set aside until required. Lightly spray cooking oil on both sides of the naan bread. Place the naan bread straight on to the grill. Cook the Naan bread for 2 to 3 minutes and then flip over. Continue to cook for a further 2 to 3 minutes or until the bread has puffed and has lovely grill marks. 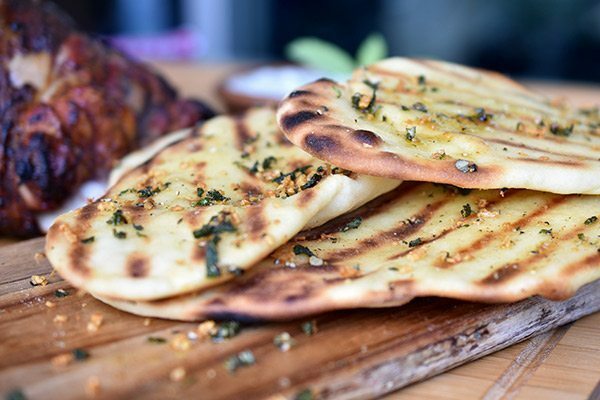 Finish off by brushing both sides of the naan bread with the herbed butter. Cooking the bread on direct medium heat will allow the bread to cook through without burning the bread.